Hello, friends! I hope you all had a truly wonderful weekend! Today I have some happy thoughts from a happy card kit! Yup! 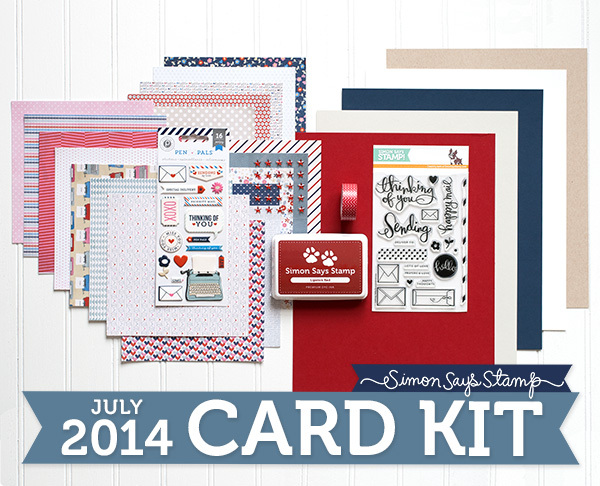 The brand new Simon Says Stamp July 2014 Card Kit is now available and it is FABULOUS!!! I jumped right into mine with a couple of fun cards. I simply could not WAIT to play with this kit! This is the first card I created with the kit. I LOVE these stamps so much it hurts. LOVE them!!! I was truly playing when I created this card, so I used a bit of everything in the kit. LOL! I used a couple of patterned papers, I used the tape, a sticker, one of the little stars, the ink, the stamps, AND the cardstock. Yup. I had fun. HA! I can promise you, these kits will sell out FAST! Be sure to hop on over to Simon Says Stamp and grab yours before they are gone! It is, after all, FANTAWESOMULOUS! This is so awesome! Love the papers and stamps! awesome card.. i love the script on the sentiment..
Oh! Awesome card design. 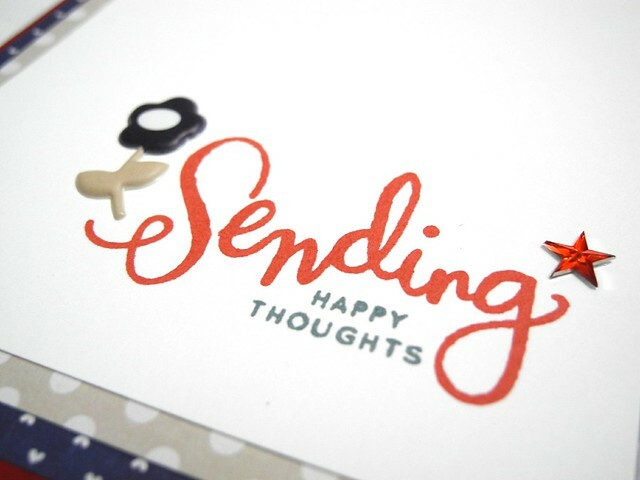 Love the layers of those papers and the pretty sentiment. Cute! Love the little flower and star and ribbon tab! Such fabulous papers Jennifer, love the CAS design of your main panel! Oooooohhh - love those papers! Awww how pretty! I love the little navy and white enamel flower! Oh my cuteness!! Love everything about this card! The color combo, the layers, the sentiment....AWESOME!